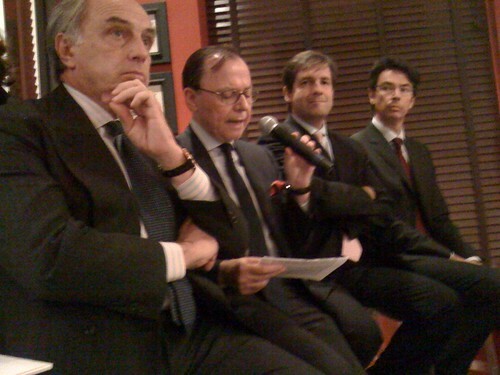 Italian Suits from COSMIT, the Italian trade Commission, FederlegnoArredo et al. Chef Mario Batali stopped by a group of diners at a press event today at Eataly to say that everyone who came into the new high-end Italian-theme eating court is ‘Italian.” But he was actually right, as sprinkled among the journalists sat the upper ranks of the Italian furniture industry all come to New York to announce one of those commercial-turned-cultural events that only the Italians can pull off without seeming crass. But that’s not all. Over at the Park Avenue Armory on December 3, artist-filmmaker Peter Greenway will be showing his multimedia spectacle of Leonardo da Vinci’s Last Supper that debuted in Milan in 2008. Here he will be upstaging himself with a replica of the dining set of the painting inside a full-scale mock-up of the nearly 4,000-square-foot apse and cupola of the Refectory of Santa Maria delle Grazie inside the drill hall. If that weren’t sweet enough, we hear that the panettone and caffe will be flowing everywhere throughout the holidays to inaugurate the 50th anniversary of the Milan Furniture Fair.